Hello! I have some GREAT news to share with you today! I have been asked to be a part of the fabulous Eyelet Outlet Design Team! I am so excited! 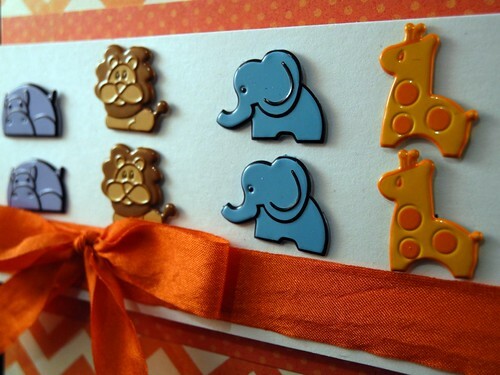 I have a card to share with you today using some of the adorable Baby Animal brads! Seriously. Could these BE any more adorable? I absolutely LOVE the sweet little critters and the colors are just fabulous! I decided to create a baby card that let these super cute brads be the center of the show! I created the card base from cardstock and then layered on a panel of the zig zag paper. I mounted the polka dotted panel and then trimmed a white cardtock panel and put the brads through that. The white panel with the brads is added with foam adhesive. Just add the ribbon and stamp the cute 2x2 sentiment and you are done! 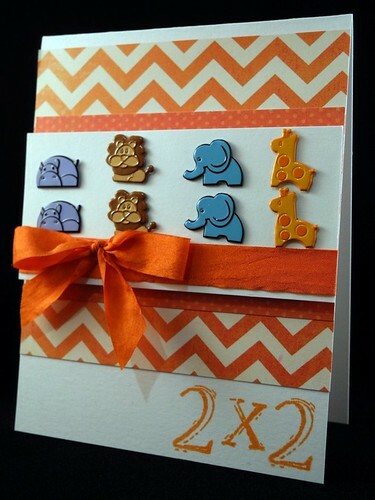 Nice and easy and really cute baby card! I just love it! I love how easy the Eyelet Outlet brads are to use and there are, of course, SO many great designs to choose from! I hope you have a super fantastic day! Oh this card IS adorable!! love those cute little brads and congratulations for being asked to be on their DT. How fun! CUTE! I love the brads! Congrats on DT team! You have a wonderful eye for papercrafting! that card is just too cute!! Yay - this is the cutest!!! So happy for your accomplishments in this amazing hobby of ours! And those brads are the cutest!!!! This card is too stinking cute! Congrats on your new DT assignment! You're incredible! Adorable card - love those brads! Oh my, this card is too adorable! Love the chevron you added and the colors is great! congrats!!! such a creative use for those adorable brads!!! Congrats! I've never heard of them before, but they have some CUTE stuff! This card is just adorable! Congrats!! And I love the card!! So adorable! GAH! I am gonna die of cute :) Look at the detail on those brads! i love eyelet outlet!!!! found them several years ago..wonderful stuff with fabulous prices!! Those brads are gorgeous!! And what a great card! Sweet card! Congratulations - looks like a good match to me !! What a super adorable card!!! Congrats on the DT gig too!!! Girl I don't know how you keep up with it all, you must never sleep!